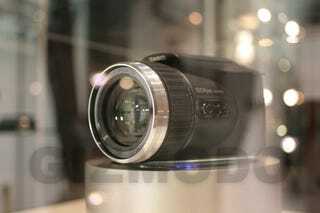 We just stopped by Casio's booth to get our eyes on the new Exilim we told you about earlier today. Shooting a drool-worthy 60fps bursts and 300fps of VGA video, it's a beefy camera—definitely heftier than my Rebel XTi (from what we could see through the glass). Something you won't see in the press release: this isn't a real SLR since no mirror is used. So internally it resembles a point-and-click more than its dSLR competition. Prototype spec dump after the jump.